This carefully hedged statement may be valid, insofar as one cannot find laws or regulations defining “special institutional arrangements” for SOEs. But it does not preclude “invisible hand” interventions on their behalf. We therefore set out to see if these exist, in terms of preferential financing arrangements. In a competitive market, it is axiomatic that more profitable firms pay lower borrowing rates than less profitable ones. Greater profitability means lower risk of insolvency. But what about in China—does this relationship hold there? The blue bars in the figure above show that private firms in China are vastly more profitable than state-owned ones. We would therefore expect them to pay commensurately lower interest rates on loans. 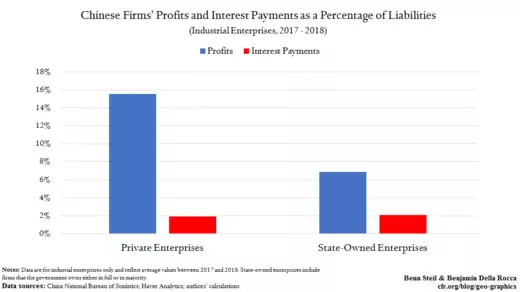 Yet the red bars show this is not the case: private and state-owned firms pay almost identical interest as a percentage of their liabilities. This finding is powerful evidence that the government is guiding banks to lend to SOEs on much more favorable terms. In short, Lighthizer is right that China offers an un-level playing field for private and state-owned firms, to the detriment of U.S. companies operating, or wishing to operate, in the country. The challenge he faces is in eliminating a subsidy whose existence can only be seen in data studies like ours.